I woke up today to find Pete Well’s NY Times Dining Section review of Guy Fieri’s Time Square restaurant featured heavily in my Twitter feed. My dislike of ‘Chef‘ Fieri (real name: Guy Ramsay Ferry) is well known to most. Maybe it’s the stupid haircut, the backwards glasses, his choice of adjectives, his inability to eat with his mouth closed or his general douchebaggery, but I just have it in for him. So, you can imagine that I read the scathing review of his 500 seat catastrophe with some delight. I honestly think this is one of the best (or at an absolute minimum, the most entertaining) restaurant reviews & I hope that it’ll end up in Dianne Jacob’s next edition of Will Write For Food. Maybe it’s a bit over the top, but odds are that Mr. Wells hit the nail on the head in regards to the food they serve. All that having been said, I do applaud his show Diners, Drive-ins & Dives which brings to light restaurants & restaurateurs serving honest food that we would otherwise never hear about. Even in my contempt for the man, there’s a silver lining. 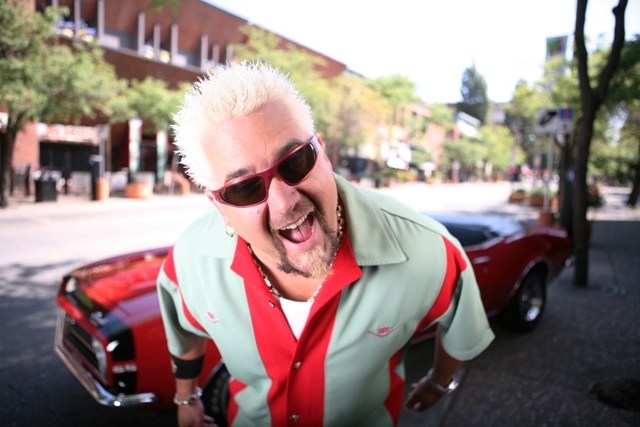 I can’t wait to see what Mr. Fieri Ferry has to say about this. Update: Check out Helen Rosner’s (Saveur) take on Fierigate.